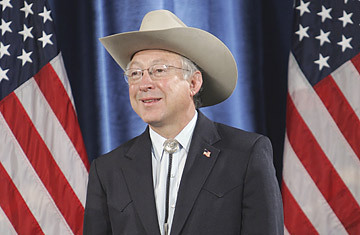 Interior Secretary-designate, Sen. Ken Salazar, D-Colo.
Ken Salazar is a hat guy, and he donned his trademark Stetson on Wednesday during his introduction as Secretary of the Interior-designate. It was a sartorial gesture that seemed both an expression of his down-home persona and a reminder that he hails from the wide-open spaces he's now charged with managing. At Interior, Salazar, a first-term Democratic Senator from Colorado, will be charged with the critical role of mapping out policies that strike a balance between preserving America's natural resources and tapping them for energy and recreational purposes. It's a tall task, and one he must accomplish without being dragged down by a department beset by scandal and dysfunction. "Short of a crime, anything goes at the highest levels of the Department of the Interior," Earl Devaney, the department's inspector general, testified before Congress in September 2006. While Salazar drew praise from representatives of the oil and mining industries as well as some conservationists, his appointment disappointed a cadre of environmental groups and prominent scientists, more than 100 of whom had signed a petition urging President-elect Barack Obama to tap Arizona Representative Raúl Grijalva. Salazar seemed undaunted by the criticism, promising to work with Obama to "take the moon shot on energy independence."  Salazar, 53, grew up with seven siblings on a Colorado ranch that lacked electricity and a telephone.  His brother John represents Colorado's Third Congressional District in the House of Representatives and could be a candidate for the Senate seat Ken Salazar is vacating.  Though he sometimes refers to himself as a Mexican American, his family has farmed and ranched on land that is now New Mexico and Colorado since the 16th century.  Has a wife, Hope, and two daughters, Melinda and Andrea.  A graduate of Colorado College (B.A., 1977) and the University of Michigan (J.D., 1981), Salazar made his name as a lawyer on water issues. He went on to serve as executive director of Colorado's Department of Natural Resources from 1987 to 1994 and later served as the state's attorney general from 1999 to 2004.  Prevailed against beer brewer Pete Coors to become the only red-state Democrat to win a first term in the Senate in 2004.  Earned a perfect-100 ranking in 2008 from the League of Conservation Voters, a nonpartisan organization that tracks environmental-voting records in Congress. His lifetime LCV score is an 81.  Made a name for himself by controversially opposing oil-shale leases in the West.  "Ken Salazar is very closely tied to ranching and mining and very traditional, old-time Western extraction industries. We were promised that an Obama presidency would bring change."  "He is a moonfaced fellow whose modest demeanor belies his reputation as an ecumenical annoyer of special-interest groups."  "Why he's interested in the job, and why Obama was so willing to hand it to him, is something of a puzzler ... The Interior secretary has almost no national profile and the position is hardly one that an ambitious politician would aspire to. It's the perfect job for a politician who wants to live comfortably  and wouldn't mind being forgotten by the general public."  "Nothing in his record suggests he's an ideologue. Here's a man who understands the issues, is open-minded and can see at least two sides of an issue."  "Mr. Salazar's most urgent task will be to remove the influence of politics and ideology from decisions that are best left to science."  "We need to be honest with ourselves and the American people about our energy future. We simply cannot drill our way to energy independence."  "The America where I grew up is vanishing today, left behind by a Washington, D.C., that has lost touch with what is important to the people of the heartland. I fear that rural Colorado, like the rest of rural America, has become 'the Forgotten America.'"  "From my point of view, they are the antichrist of the world." To a Colorado Springs television station in April 2006, about James Dobson's Focus on the Family group. He later said, "I regret having used that term. I meant to say this approach was un-Christian, meaning self-serving and selfish."  "I've been taunted, called names  from dirty Mexican to lots of other names  as I was growing up, and even now as a United States Senator. To have that personal experience in having gone through that kind of discrimination, it helps in terms of informing the debate and bringing a certain sense of reality to some of the issues we are dealing with on a national level."